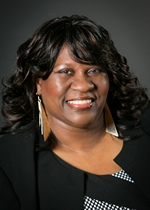 Audrey Williams, Interim Executive Director and Controller at SSO, has over 31 years of accounting experience and a comprehensive knowledge in the areas of: Accounts Payable/Accounts Receivable, financial reporting and analysis, budget preparation, and financial closing procedures. Audrey specializes in overseeing SSO's accounting functions, including managing central billing for over 90 tenants in which she provides each organization with the convenience of one itemized invoice for all services on a monthly basis. Prior to her tenure with SSO, Audrey gained valuable experience in nonprofit accounting management and collaboration both internally with department managers and externally with clients. This was followed by her transition into two consecutive Assistant Controller positions for well-respected organizations. In these roles, Audrey developed a more thorough understanding of financial and office operations management. Audrey hails originally from New York, and then called Northern Virginia home for nearly a decade. While residing in Northern Virginia, Audrey earned her B.S. in Accounting from Hampton University. She later moved to Maryland where she became a Licensed Real Estate Salesperson for the state in 2008, providing her with a unique understanding of tenant leases and the overall property management side of SSO as it relates to finance. For the past ten years, Audrey has called Chester, Virginia home.